Many of our visitors are curious about how a glider flies. Rather than provide a textbook on theory of gliding flight, we have provided a list of the most frequently asked questions. We hope that this will help satisfy your curiosity, but if you would like to know more, please ask your instructor. Q	How does a glider stay in the air without an engine? A	An aircraft flies when air passes over the wings and generates an upward force which counteracts its weight. A powered aircraft is pulled through the air by the engine, a glider is more like a bicycle free-wheeling downhill. This movement makes the air pass over the wings to generate the necessary upward force. Q	How is a glider steered if there is no engine? A	A glider is an aeroplane with the same controls as any powered aircraft, so it is fully controllable. The additional skill required by the glider pilot is ensuring that there is enough height to get where s/he wants. Our 2-seater training gliders are equipped with dual controls so that the instructor can demonstrate the control movements required before the pupil has a go. Q	What controls does a glider have? 1.	elevator: this is the movable horizontal surface on the tail, it is used to alter the speed of the glider. It is controlled by moving the stick forward and back. 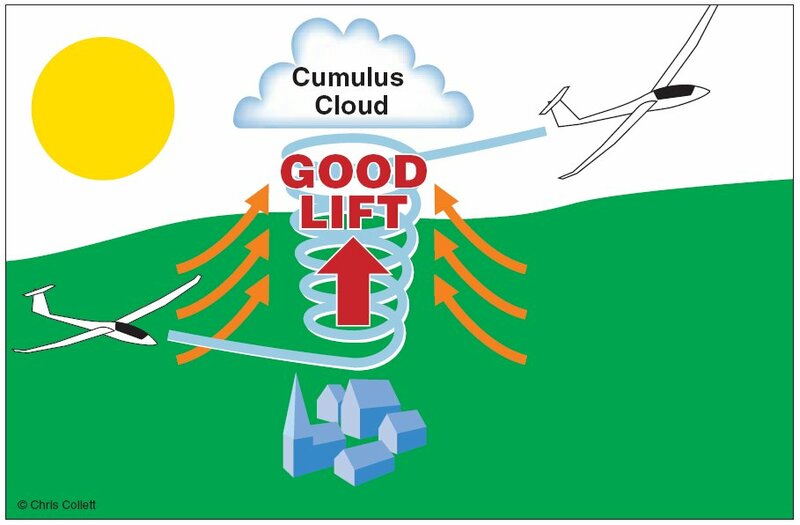 The effect of moving the stick forward is to lower the nose of the glider, so it is flying down a steeper 'hill' and therefore picks up speed. Moving the stick back raises the nose and causes it to slow down. 2.	ailerons: these are on the trailing (rear) edge of the wings, they are used to raise one wing and lower the other (roll). This is the equivalent of leaning into turns. The ailerons are operated by moving the stick sideways; to roll to the left, move the stick to the left. Once the glider has rolled, it will turn in that direction. 3.	rudder: this is the vertical movable surface on the tail, operated by pedals. The effect of the rudder is to swing the nose of the glider to point in a different direction (yaw), but if the wings stay level then the glider will continue flying (sideways) in the same direction. To turn the glider, we use ailerons and rudder together. In the turn, the rudder is used to counteract 'adverse yaw', caused by drag on the top (outside) wing. Gliders also have airbrakes which are used to spoil the lift generated by the wing. This makes the glide path steeper and enables the pilot to control where the glider touches down in the chosen landing area. Q	How does the glider get off the ground? At Booker we use powered aircraft (tugs) to tow the glider into the air. 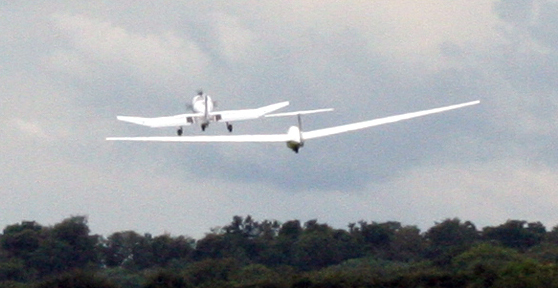 The glider pilot releases the tow rope from the glider when the combination has reached the desired height and the tug returns to the airfield with the rope trailing behind. 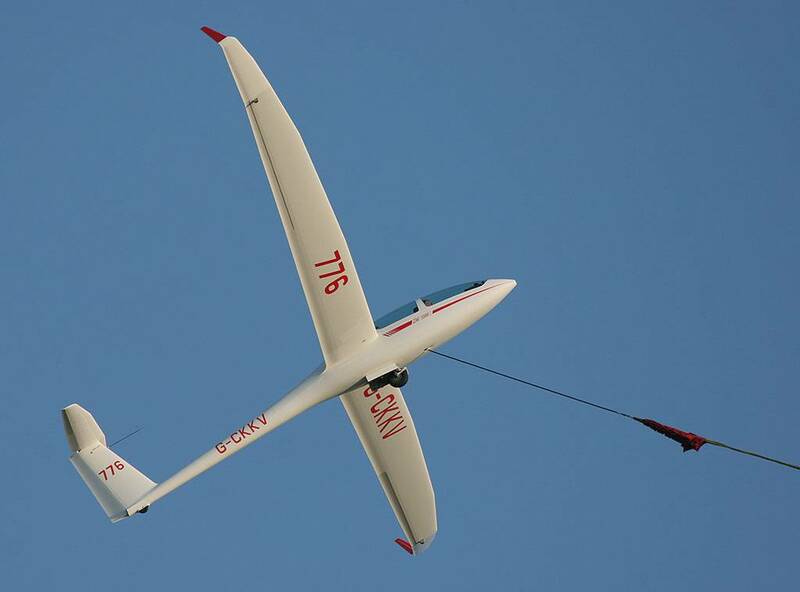 The advantage of the aerotow is that the glider pilot can be taken to a thermal and can choose the height for release. Some gliding clubs use a winch, which is positioned at the far end of the field. It winds in a cable attached to the belly of the glider which is launched at a steep angle rather like a kite. Winching is relatively cheap, but the disadvantage is that the glider always ends up in the same place, and not very high, so flights can be quite short. Q	How long can a glider stay up?
" thermals: a bubble of warm air detaches itself from ground heated by the sun. It continues to rise while it is warmer than the surrounding air. The pilot circles in the bubble to gain height. Eventually the bubble cools to the point where the water vapour in it condenses to form a cloud. The best kind of sky for thermal soaring is a blue sky with fluffy clouds, because the clouds mark where the thermals are likely to be.
" 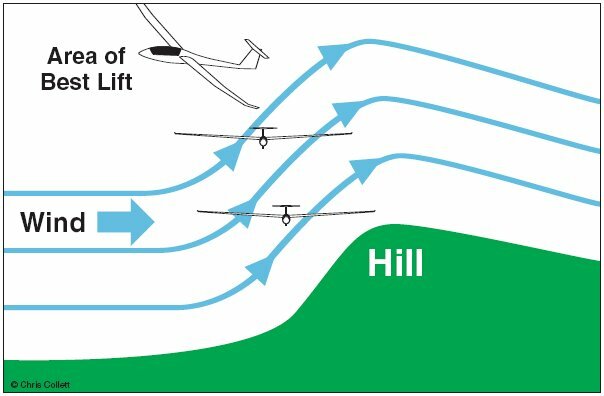 ridge or hill lift: wind blowing against a ridge rises in order to pass over it. Pilots fly back and forth along the ridge in the band of rising air. This type of lift does not go very high, but if the ridge also faces the sun then it is possible for thermals to be generated, so the pilot can climb away from the ridge and explore elsewhere.
" 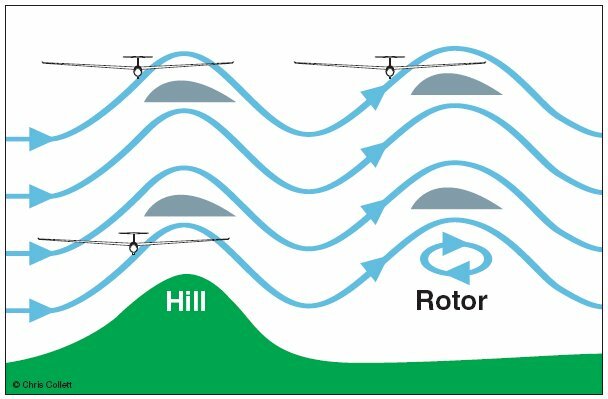 wave: wind blowing over hills and mountains will often 'bounce' and set up one or more standing waves downwind of the hill. These waves often go much higher than the hill which has triggered it, so by flying back and forth along the wave it is possible to climb to great heights. Pilots also use this kind of lift to fly cross country. Q	How does the pilot land the glider? A	The pilot flies a circuit, starting upwind and to one side of the chosen landing area, and ending into wind for the approach and landing. The pilot adjusts the circuit as necessary so that it is possible at any point to turn in early and land if there is not enough height to complete the circuit. On a cross country flight the pilot may find that there is no longer enough lift to continue, and so will select a suitable field, fly and circuit and land - and then phone a friend to come with the trailer to get the glider home. Q	What's cross country flying like? Pilots usually decide together the task they will fly, which means that they can watch each other en route to find lift, and they share their logger traces afterwards in order to learn how to fly more efficiently and faster. Some pilots are not interested in racing and fly cross country to enjoy the experience and the views. For more information see our page about Cross Country soaring at Booker. A	There are regional, national and international gliding competitions, usually lasting 9 days, during which pilots race against each other over a different set task each day. There is also a gliding ladder where pilots enter their flights throughout the year, accumulating points for distance flown. This enables pilots to compare their performance with fellow club members and pilots from other clubs. The best way to learn about gliding is to visit our club.